Schools are places where a lot of resources are consumed and a lot of waste is generated. They are also places where the next generation of leaders, thinkers, consumers and conservers work to acquire the skills necessary for success in the world of tomorrow. There are school resource kits available for download in both English and French which contain loads of tips and ideas to help engage your students. Here are a few fun game ideas! Does your School intend to collect items for recycling and/or re-use as part of Waste Reduction Week? If so, FROGBOX will loan the use of their 70 litre industrial-strength, eco-friendly boxes – they’ll even drop them off and come back to get them, when you’re all done! Make Recycled Paper is a fun activity that helps teach about trees, resources and conservation. For younger students, we suggest a method that does not require the use of an electric blender. Design posters showing how to save paper or water or energy, how to reuse a common item, or what to put in the blue box or recycling depot. Any environmentally friendly action can be depicted including bicycling, composting, mowing with a ‘reel’ mower, or using environmentally friendly cleaners. Coming up with a catchy slogan to promote the practice makes it even more fun. Students can vote for their favourite poster. To highlight the idea of Reuse, have students make an art piece using materials that would otherwise be thrown away. This can be a revealing and imaginative project that draws attention to the amount of waste that we produce. Afterwards, have a discussion about packaging materials, and get students to research over-packaged items that are for sale in stores. Advertising is everywhere, and youth are often the target. Have each student find and analyze one or two newspaper or magazine ads, and discuss what the ads seem to be saying. Do the ads imply that students will be smarter, more attractive or more popular if they buy the product that is being promoted? Is it true? As a follow-up, have students design an ‘alternative’ ad that makes riding a bicycle as attractive or glamorous as driving a sports car. Or one that makes healthy food as appealing as sugary junk food. Or one that promotes the positive value of environmentally friendly practices like composting, recycling, walking to school or any other waste reduction activity. Have students research the amount of waste generated by an average Canadian versus the average for someone in a developing country that they choose. What are the lifestyle differences between the two cultures that explain the different amounts of waste? Explore the “Ecological Footprint” idea and discuss what would happen if everyone in the world had a footprint equal to the average Canadian, and what we can do to reduce our footprint. Students can choose a product or food item (e.g. bananas, canned tuna, a pencil, a computer, a pair of jeans), and find out what resources went into making the item and where those materials came from. What chemicals or other inputs were used in its production? How far did it travel to arrive in the student’s hands? How was it packaged? Were any of the materials in the product or package made from recycled materials? Are the materials renewable or non-renewable resources? What are some ways to reduce the environmental impacts associated with consumption? Vermicomposting is a process using a type of worm called ‘Red Wrigglers’ to break down organic materials (food waste). It is done indoors using a small box, and is well-suited to classrooms. 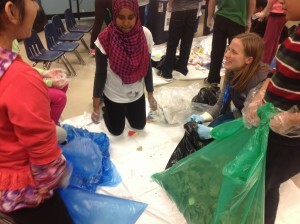 Many teachers have found it to be an effective starting point for discussions on waste reduction and cycles of nature. Students enjoy watching the worms break down the waste from their lunches. For more information on vermicomposting, and how to get started, Green Action Centre has prepared a guide to vermicomposting. Have students design small reminder signs – Please Turn Off Lights, Please Recycle, and so on – and post them near light switches, taps, garbage cans, photocopiers and printers. Try to come up with catchy slogans and images. For older students, this can be a follow-up to an environmental audit. Have students practice their letter writing skills by writing a letter to the editor or to an elected representative explaining how they feel about the environment and why they think that it is important to protect it (and how). This can be an exercise in how to make a case for something, supported by evidence and expressed in ways that invite a positive response. Host a speaker on an environmental issue. This could be anyone with responsibility for waste reduction or expertise in an environmental area. In Winnipeg, teachers can contact Green Action Centre’s Environmental Speakers Bureau to book an environmental presentation. The list of topics is availablehere. Encourage students to pack litterless lunches throughout Waste Reduction Week. Over the course of a week, weigh and chart the non-food garbage left at the end of each lunch period. Challenge another classroom to see who has the least amount of garbage at the end of their lunch. This can be a school-wide contest and teachers can compete, too! Start a walking school bus where parents take turns walking neighbourhood kids safely to and from school. Walking school buses increase safety around school zones because they help to reduce congestion and traffic. Children (and parents) benefit through increased physical activity. And avoiding motorized trips helps to reduce greenhouse gas emissions. For more information and help on starting your own walking school bus, visit Green Action Centre’s Active & Safe Routes to Schoolprogram. Organize an event where students bring in books or toys that they no longer use. This can be done as a free exchange, or the items can be resold cheaply with the money raised going towards a school project such as the purchase of a compost bin or trees for planting on school grounds. Visit our Second Chance Market October 24!